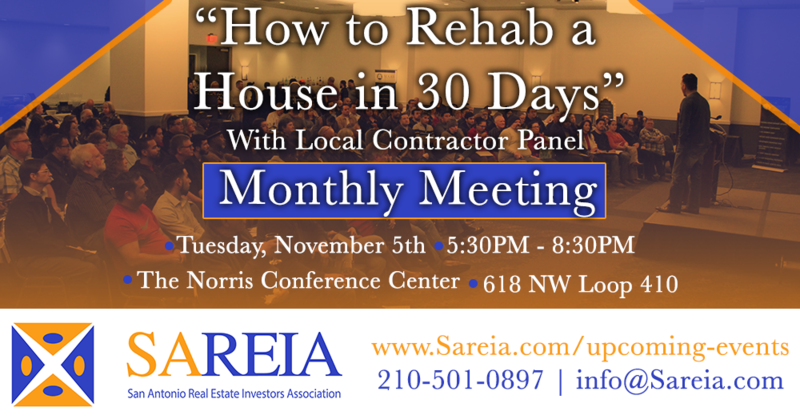 San Antonio Real Estate Investors Association - Monthly Meeting - "How to Rehab a House in 30 Days"
Monthly Meeting - "How to Rehab a House in 30 Days"
If this is your first time attending a monthly meeting, please email info@sareia.com for the code. If vendors would like a private table, they must RSVP here. Real Estate attorney, investor, broker and president of SAREIA, Victor Maas. As many of you know, Victor has been investing in Real Estate over 15 years. In addition, Victor has closed 100's of transactions ranging from Sub-2 deeds to full-blown rehabs. Please join us as we discuss flipping houses; we will break it down step by step for you. Victor Maas is going to share with you the system he uses to flip his houses in 30 days or less. Things that will be covered are what he does first, what he fixes, what he replaces, what he budgets for and so on. We will also have local contractors and well as representatives from the City's permit department who will be giving their inputs on flipping in SA. Be sure to bring your notepads and questions because this one is going to be good! SAREIA is also a terrific place to network with like-minded folks and build your real estate investing team. Several vendors will be in attendance to answer questions about private money, title closings, rehabs, buying wholesale deals, etc.